Mind the Minions: Things I'm Loving Number Three! Things I'm Loving Number Three! she is adorable!! loving your list. I love the way she sleeps through most of your photos! So cute! She is so tiny & precious!!! You make me also want a 3rd! 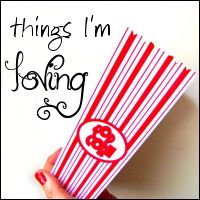 Things I'm Loving Number Five! Things I'm Loving Number Four! Things I'm Loving Number Two!